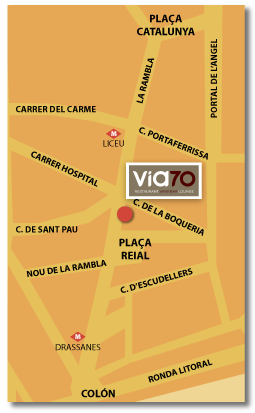 VIA 70 restaurant is located in Barcelona’s charismatic Old Quarter, on the famous Rambla, just in front of the Liceu theatre. 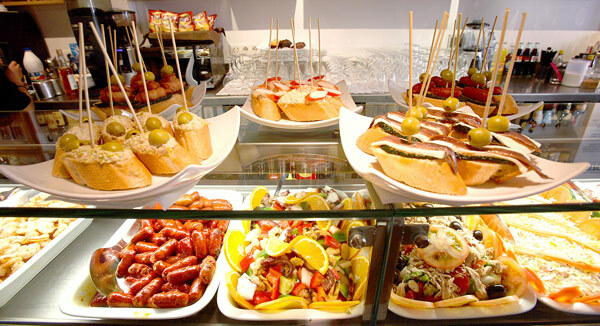 This restaurant offers typical Mediterranean cuisine in a great environment featuring modern decorations, as the restaurant was completely renovated in 2010. 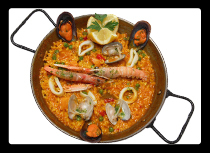 Our extensive menu features traditional paellas in a variety of styles: seafood, mixed, meat and veggie paellas, not to mention our black rice, fideua, and the exquisite lobster rice. 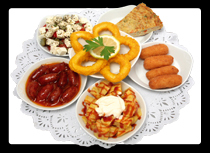 In addition to our paellas, we also offer a wide selection of traditional tapas served individually or in assortments of 6, for two people. Many types of meat (fillet, sirloin, veal cutlet, 500-gram T-Bone...), and fish (sole, sea bream, hake..) plus appetizers (fresh gazpacho, mussels marinara..) salads, combination platters and a piece of Italy in our pasta dishes and assortment of pizzas. 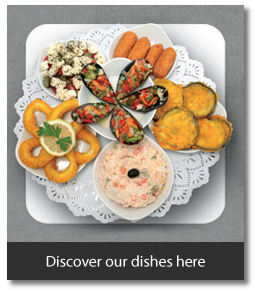 We also have a wide variety of vegetarian dishes, so everyone can enjoy our Mediterranean cuisine. What better to accompany these delicious meals than a good wine? Our well-stocked wine cellar features local wines from the Torres and Perelada wineries, as well as a variety of Rioja wines. Once night falls, the lights dim to create a more intimate setting reminiscent of a lounge bar where you can enjoy a mixed drink or cocktails. 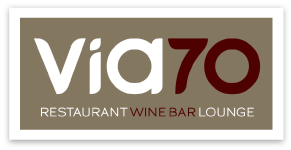 VIA 70 restaurant has a large dining room, which seats 70, as well as an outdoor Terrace available year-round and conditioned for smokers, located in the heart of the Rambla, which runs from Plaça Catalunya to the Columbus monument. 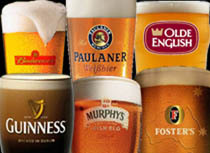 Our typical clients are from all walks of life, including young people, couples, families, business people, tourists, etc. 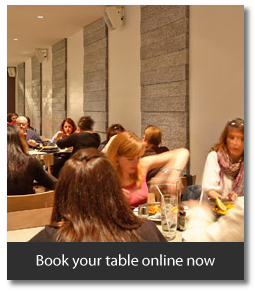 Remember, you can book a table online using this website. To see photos of the bar, click on gallery. 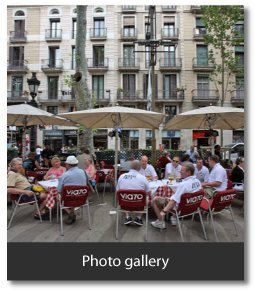 When the user fills out a form with their personal details and accepts to submit it, they EXPRESSLY AUTHORIZE www.barinbarcelona.com to handle this data and add any personal details provided on said form to the database, as well as any data generated as a result of their participation and/or use of the various services offered on this site. As such, the user is hereby informed of the automated handling to which all of their data to which www.barinbarcelona.com gains access as a result of their browsing of the site will be subjected. By sending their details, the user consents to the handling of said information, as well as its transfer to third parties, under the conditions detailed in the Privacy Control section. Except where otherwise indicated, submission of information required in Personal Details will be voluntary, and refusal to do so will in no way diminish the quality or quantity of services available to the user, unless otherwise noted. Exclusively for users who have given prior authorization, www.barinbarcelona.com provides a Newsletter service with information on issues related to www.barinbarcelona.com and, circumstantially, other services www.barinbarcelona.com believes would be of interest, although not offered by this site. The user is understood to have granted the authorization established in the previous paragraph when, in requesting and gathering data, www.barinbarcelona.com duly informs the user of the possibility of receiving the Newsletter and the user does not oppose. www.barinbarcelona.com provides users who so request a mechanism through which to be excluded from the Newsletter service. www.barinbarcelona.com, has adopted the technical means necessary to avoid any unauthorized access to, handling of, alteration or loss of the data provided by the user, taking into account the limitations of the Internet. As such, the user accepts and recognizes the limitations of this media, and agrees that www.barinbarcelona.com would not be held responsible for any loss, misplacement or unauthorized manipulation of the data beyond the control of www.barinbarcelona.com. The user has the right to access any information held on them in the www.barinbarcelona.com database, correct it if erroneous, suppress or oppose the handling of said data by e-mail to info@barinbarcelona.com or in a signed letter (with copy of photo ID enclosed) addressed to the database holder, in this case www.barinbarcelona.com. The user will be understood to have accepted the established conditions if they click on the 'SEND' button on the data entry forms. The personal details collected from our users are stored in a database owned by www.barinbarcelona.com, which guarantees the appropriate technical and structural measures are employed in order to ensure the integrity and security of all personal data provided. The information gathered is appropriate, pertinent and not excessive with regard to the specific, explicit and legitimate sector, purpose and services of www.barinbarcelona.com. The user has the right to access this information, correct it if erroneous, and be removed from the database. In this last case, www.barinbarcelona.com loses said information automatically. These rights may be implemented immediately when the user manifests their express desire to be excluded.